After seeing Cheah post her beautiful Pumpkin Choc Chip Muffins, I also wanted to bake some as I still have some pumpkin leftover in my fridge. Totally agree with Cheah, these muffins are moist and delicious. especially with the chocolate chips and cranberries in them. Definitely going to bake these again soon. and hosted by Eileen (Eileen’s Diary). 1. Can i skip the Cinnamon powder for this recipe? 2. How will be the measurement for 30 muffins? i wonder if i double the ingredients, the taste will not be the same as above. Appreciate if you could give some advise for baking 30 muffins measurement. Is really no problem to use my recipe. Cinnamon powder pairs well with pumpkin but you definitely can use vanilla flavour if you prefer. You can use a smaller paper cups and double the recipe to make up to 30 muffins. If you have a big oven at home to bake 30 muffins, why not? Otherwise make the recipe one at a time. The taste will only be different for using vanilla flavour. Thanks Ann, Appreciated your advise, i will give a try this weekend. Looking forward the result as well. The muffin looked so good, like straight from a classic baking book. Beautiful. beautiful muffins, look moist and good! 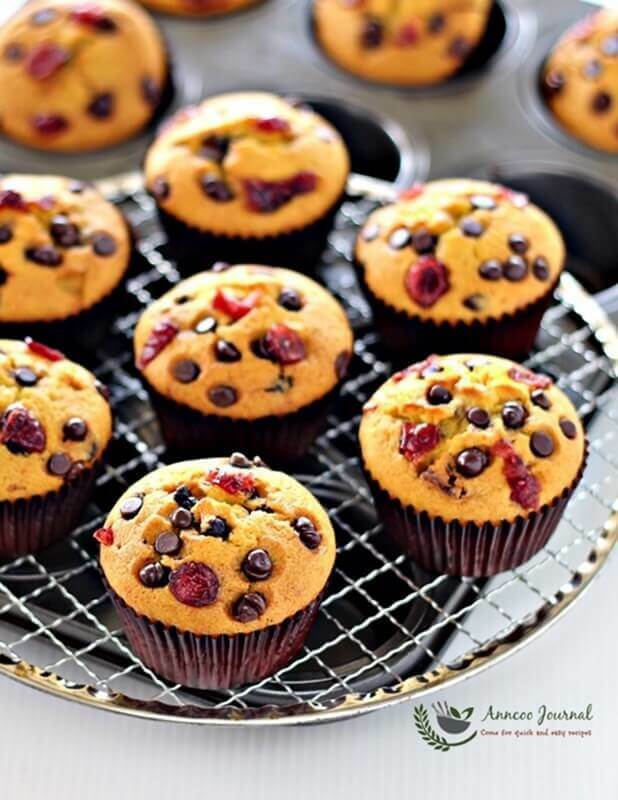 I love the lovely chocolate chip and dried cranberries on top of the muffins. Its like little gems stud on the muffins. Lovely!! Great idea to add cranberries! 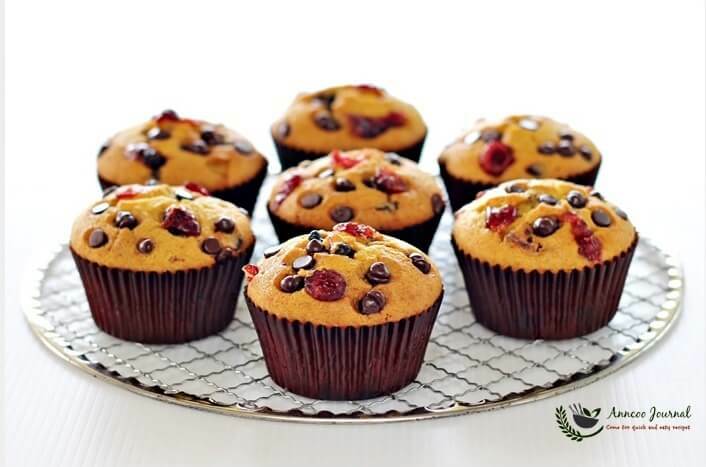 Definitely craving a couple of these muffins to devour right now – they look super delicious. Ann, these muffins are very pretty, so xmas feels too, bookmarked! Your delicious festive looking cupcakes make me wish that Christmas is here now! These muffins look so tempting. Love the colours and thanks for the link! Hi Ann..your muffin looks so christmasy..i love it very much.. The color is so great! And I love that you have added chocolate chips and cranberries! These muffins look so festive and adorable! I would love one now for my morning tea, Ann. Yummy ! 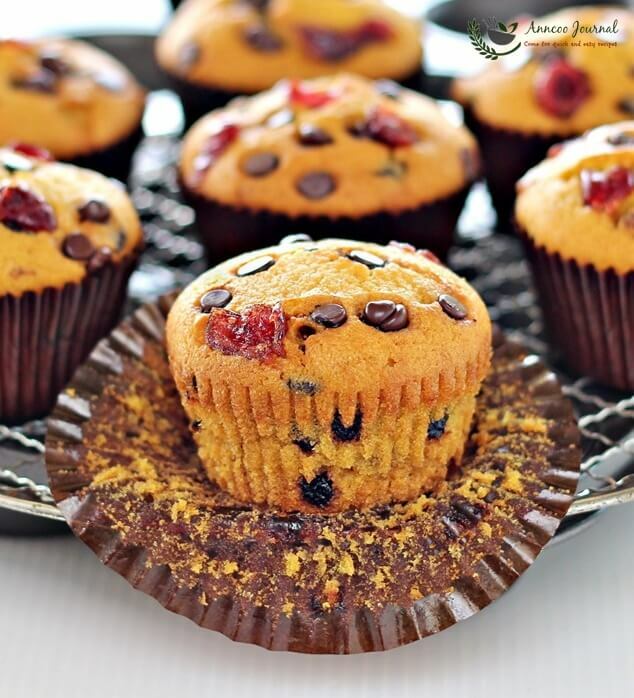 These pumpkin chocolate chips muffins look so tempting and delicious! Haven't had pumpkin in my bakes before 😛 Those muffins certainly look wonderful ! Hi Ann, you are good at baking. This one looks so tempting. I saw Victoria's with oatmeal too. I'm going to add this to my must try list. Thanks for sharing. Definitely looks delicious! will try it! 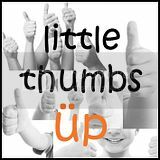 I guess children will like this recipe especially with lots of Chocolate chips.